The third-year students presented educational posters to campus on Feb. 7, which were reflective of their work in Saint John and advocate for policies and programs to address the overall health and well-being of the community. This event counted as credit toward an integrated care clinical practicum, which emphasizes health policy. The presentations focused heavily on safety, including smoke-free environments, health literacy and translation, ally and safe spaces, medication dispensing, trauma informed care, intergenerational poverty, food security and naloxone programs. “This learning opportunity would not have been possible without the commitment of community partners, our faculty and the hard work and enthusiasm of our students, in addition to the financial support we received from the Office of Experiential Education and FutureReadyNB,” says Kimberly Wilbur, instructor in the department of nursing and health sciences at UNB. Community partners included the Alzheimer Society, Avenue B Harm Reduction Inc., Elizabeth Fry, First Steps, Horizon Health Network, KV Oasis, Learning Exchange, NaviCare, New Brunswick Social Development, Romero House, Safe Harbour, Saint John Correctional Services, Sophia Recovery Centre, St. Joseph’s Community Health Centre, Teen Resource Centre, UNB Health Centre, UNB Ally Safe Space, YMCA and YWCA Fresh Start Services. “This experience not only helped me to improve my communication skills and verbal fluency with confidence, but, more importantly, offered a unique platform to inform the public and other students in the university about the structural problems and health inequities experienced in the community,” says Kay Grant, a third-year nursing student. “By participating in these presentations, I was able to develop my ability to relay my knowledge to faculty, students and community partners in a professional academic setting. Experiential opportunities such as these really help me pull together the skills that I’ve developed over the course of my undergraduate degree,” says third-year student Melissa Whitney. 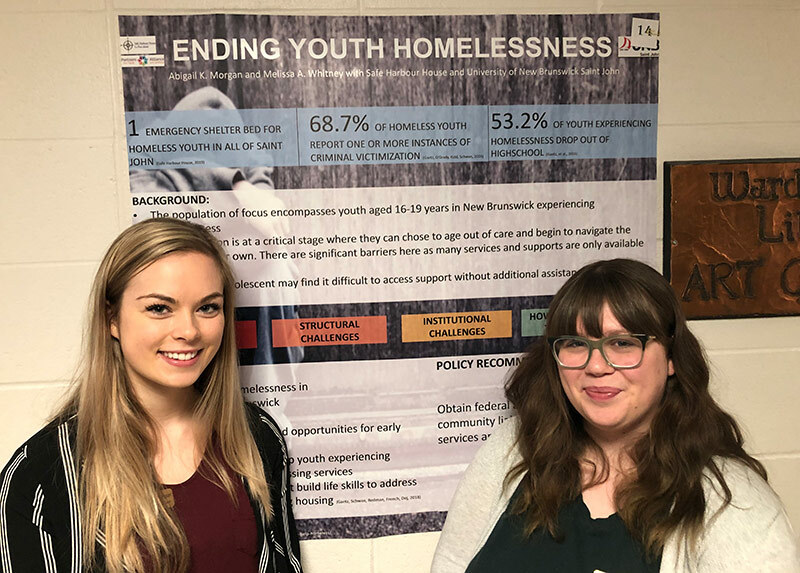 Photo: Abigail Morgan and Melissa Whitney with their poster on Safe Harbour and Youth Homelessness. Credit: Scott Thomas.